More than half of baby boomers and Generation Xers do not realize how much they are likely to pay out of their own pockets for medical bills after they retire. Many “were seriously underestimating the amount of savings they would need to accumulate in order to cover health in retirement,” according to what may be the first comprehensive survey and analysis of what Americans expect to pay – and how far off their estimates are. The good news is that Medicare pays roughly 60 percent of retirees’ total costs. The bad news is that they have to somehow cover the other 40 percent, which is particularly expensive for those who live longer (read women). If this new study carries one big message, it is that boomers need to learn more about what will certainly be one of their biggest retirement expenses. 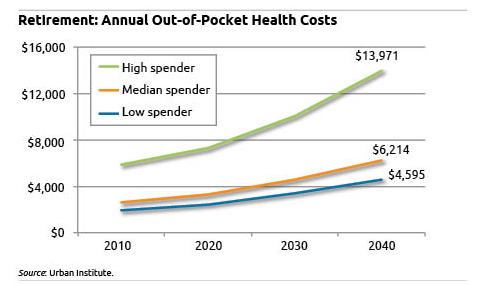 For example, by 2020, the range of out-of-pocket spending is expected to vary from $2,453 per year for a typical person with low health care needs to $7,272 for the typical high spender. Boomers also may not be aware that the bite that Medicare premiums take out of their monthly Social Security checks will increase sharply by 2020. The new analysis of the disparity between future retirees’ expectations and what they’re facing was conducted by law professors Allison Hoffman at the UCLA School of Law and Howell Jackson at the Harvard Law School. Over 52 percent of people surveyed who are already retired or are baby boomers or Generation Xers substantially underestimated how much they would spend every month, compared to what the experts predict for typical retiree medical costs in the future. Women’s estimates were more inaccurate. They live longer and must pay more to supplement their Medicare coverage, but they believe that the total amount they will spend over their years of retirement is lower than men’s totals – $30,000 for women versus $60,000 for men. The authors cite other research showing that high-income people spend more on health care, because they can. In the last years of their lives, those at the top of the U.S. income scale spend 2.5 times more than retirees with the lowest incomes – that’s a big gap. When wealth comes into play, that gap is even greater. And even healthy people will eventually suffer chronic diseases that will drive up their spending for health care. People who live longer will pay these medical bills over more years, causing them to incur higher lifetime health care costs, according to 2010 research by Anthony Webb, a research economist with the Center for Retirement Research, which funds this blog. Hoffman and Jackson’s study, which is a fairly easy read, provides other useful information for retirees. Out-of-pocket medical costs for retirees include premiums for Medicare and supplemental “gap” coverage (39 percent of total average costs), doctor visits and supplies (15 percent), prescriptions (14 percent), dental care (6 percent), and hospital visits for in-patients and out-patients (5 percent). Long-term care costs, which were excluded from this study, account for 19 percent. Prescription drug costs are capped at $4,700 in 2012 under Medicare’s Part D drug program. Annual costs are capped at $6,700 for those who enroll in Medicare Advantage (rather than Medicare’s fee-for-service program, known as Parts A and B, which has more open-ended costs). Medigap policies vary by state but premiums range from $100 to $400 per month. To share this information with friends, we encourage you to “like” us on Facebook! Now people realize why retirees fight tooth and nail to keep Congress from messing with their Medicare. Senator Ryan’s proposal will certainly have an impact on people under 55. The eligibility age for Medicare would gradually raise from 65 to 67 by 2034, and cap its spending increases at half a percentage point higher than the gross domestic product. So imagine recessionary years where the GDP contracts! For those of us under 55, the government would provide us with a set amount of money annually so that we could either purchase a private health plan or the traditional government-administered program. So it is crystal clear that as medical costs rise faster than the size of the annual subsidy, a greater shift of the burden will be on us future retirees.